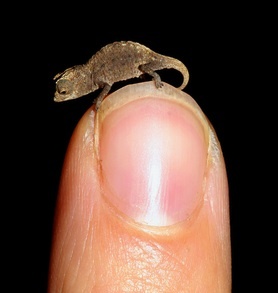 Sciblogs | The littlest chameleon? More seriously, these photos are from a scientific paper reporting the discovery of four related species of miniature chameleons from Northern Madagascar. The abstract reports that ’The newly described Brookesia micra reaches a maximum snout-vent length in males of 16 mm’ with total lengths (i.e. including tail) in both sexes of 30mm. The first half of the introduction section of the paper is worth reading and introduces giantism and (island) dwarfism – I won’t repeat what they’ve explained there. It’s a good read, the odd formal word choice expected; lots of interesting factoids for us non-zoologists or envious armchair amateurs. Animals are complex things, with many organs and tissues. Among other things these small creatures ask ’how small can you go?’ and what compromises are involved in evolving to extremes small sizes. This follow-on post Miniature chameleons: beyond the â€œSquee!â€ points to the issues of survival for these wee guys and that few articles are mentioning this. I have to hold up my hand here and say mea culpa. I did see this, but elected not to add it. My excuse? – in trying to jam out something before crashing for the night. They also raise the issue of poaching.